Busy Weekend! [Sunday, April 1, 2007] Whew! Lots of stuff done this weekend! Nope, no April Fool’s joke, lol. 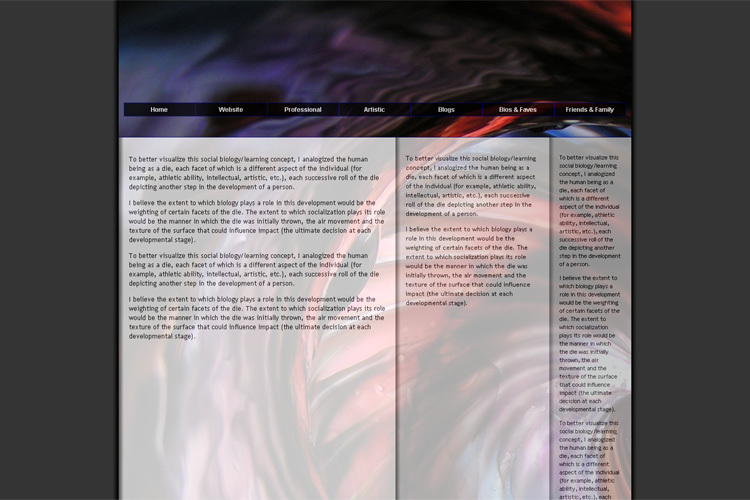 But late last night, finished PHP/CSS-coding the header for my website. The test page looks almost identical! Then later today, Sunday, finished re-coding the footer. Looks pretty good too! Next is the main page with sidebar. Once I re-code that, then I can transfer the page content to the new template. Whew! Here’s the PHP test page. Well, beside this project, also cleaned up much of the house. Dusted, wiped, even scrubbed much of the kitchen countertops, cleared off the table, emptied the trash. Sweeped the garage, tried to scrub away as much I could, the old oil stain on the concrete. Vacuumed the TV room and Jen’s old bedroom and bathroom. In fact, moved the four-post bed and dresser. Still need to do more, but a little later this week or weekend. Double whew! This entry was posted in Battlestar Galactica, Blogs, House, PHP, Planetes, Web Design. Bookmark the permalink.